John Mayall has backed up some of the legendary originators of blues music, and had some of rock’s greatest guitarists back him up. 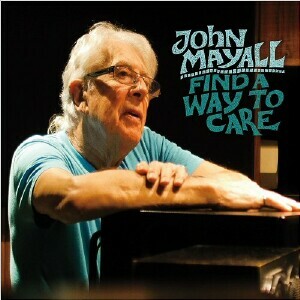 Now, at just shy of 82 years of age, Mayall’s voice still sounds rich and emotive on ‘Find A Way To Care’, the blues man’s recent release, and third album by his current band of Greg Rzab, Rocky Athas, and Jay Davenport. Each track on this new CD is labeled with the key it’s in, to facilitate jamming along with the band, which seems a reasonable expectation given the feel-good, lets-just-get-in-to-it nature of these twelve songs. The most sincere messages of the blues pour out of this music’s soulful essence… lost love, regret, poverty, unfulfilled desire… all delivered with uncompromised conviction and directed point blank straight in to the heart of the listener. The current trio working with Mayall shine brightly, such as veteran Texas guitarist Rocky Athas’ scorching lead guitar breaks on “I Want All My Money Back” and “War We Wage”, tastefully complimented by the bandleader’s Hammond organ. Often, Mayall’s piano rhythms showcase a healthy dose of boogie-woogie and perhaps even a bit of Tex-Mex or Cajun flavor. Which, comes as no surprise, given his penchant for Native American and Southwestern culture, design, and fashion. In fact, John Mayall himself has begun to assume the character of the elder shaman of the blues. One who has the wisdom, mojo, magic, and keen vision in to the future of this most American of all musical art forms, the blues. Which is pretty wild for an Englishman!